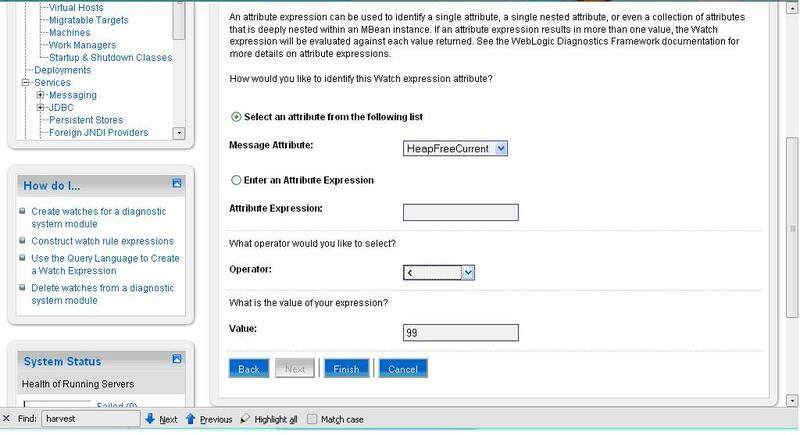 Weblogic Diagnostics Framework can be used to analyze, collect, archive and access diagnostic data generated by a running server and the applications deployed within its containers. 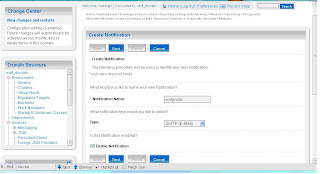 Here I have provided configuration for sending mail notification on the harversted data for the runtime Mbean which you want to monitor. 1. 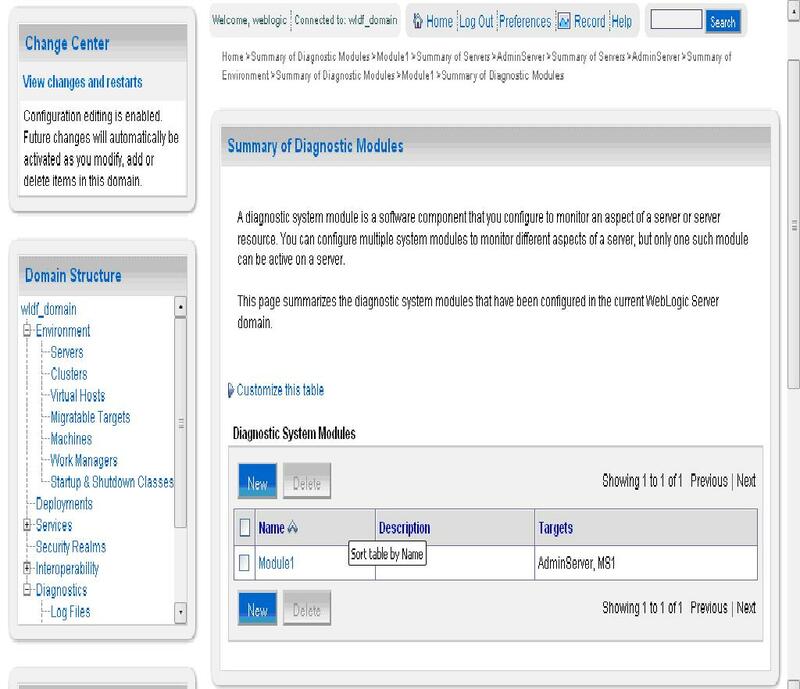 From <domain_name> -> Diagnostics -> Diagnostics Module Create a diagnostic module and target it to server for which WLDF module has to be used. 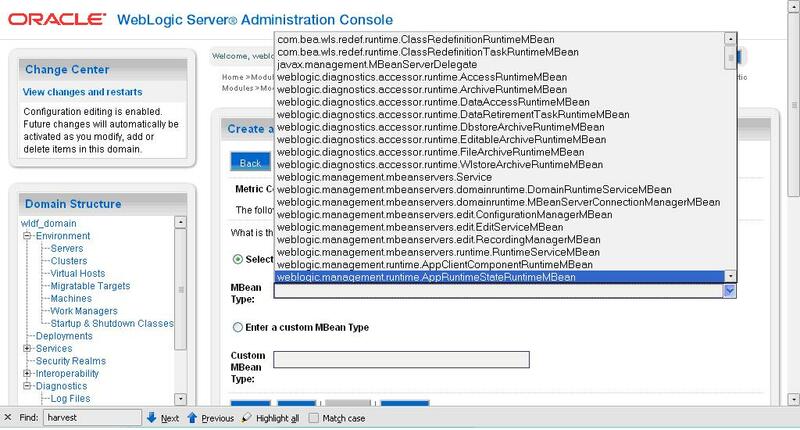 b) Select the Mbean Server location for which we want to collect data. 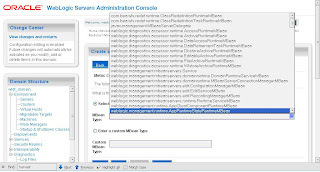 It can be DomainRuntime or ServerRuntime Mbean. 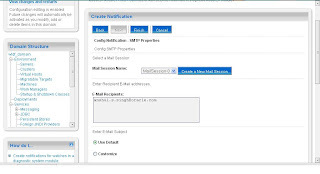 b) Here select the Mail session which we configured in Step 3 along with the Email Recipients who will be receiving the mail notification for Runtime mbean. 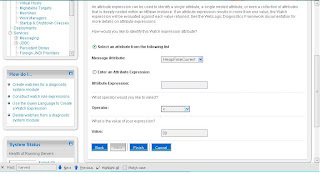 Here we can edit the format of Email notification. Click Finish. 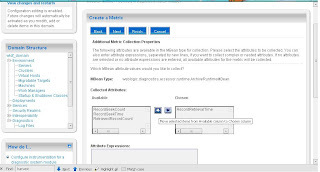 d) Select the attribute for which watch has to be configured and apply desired operation to it. 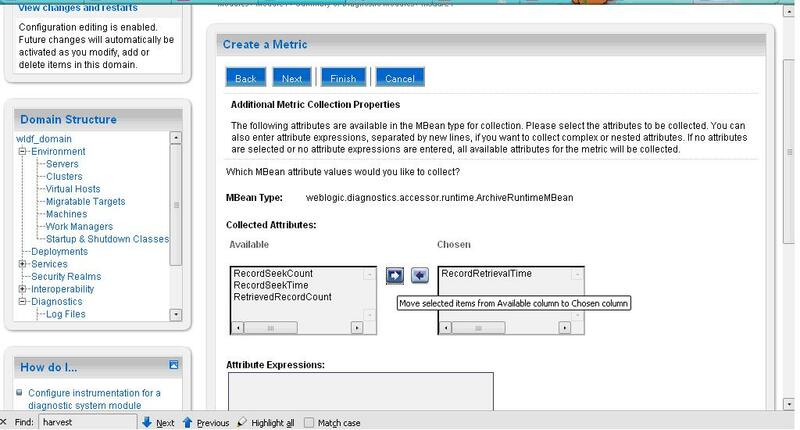 Attribute should be same as what we have configured in Collection Metrics. 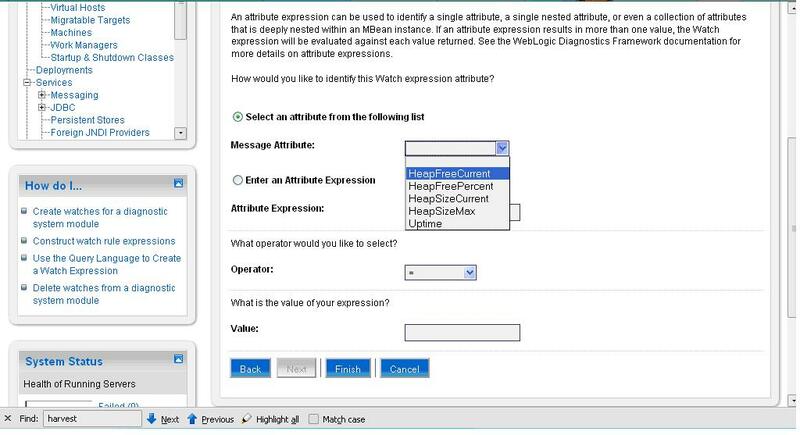 f) Verify the Watch Rule Expression created from the previous steps followed. 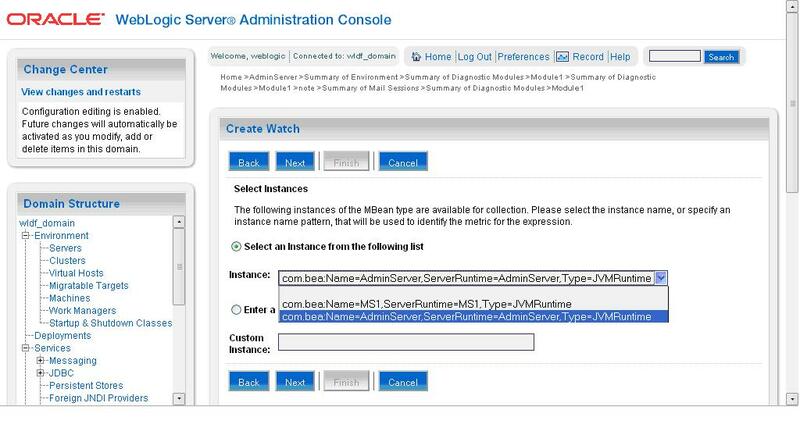 If you want the same mbean to be monitored for more than one server then click on ‘Add Expression’ tab follow steps 5-a through 5-e for other server instance. 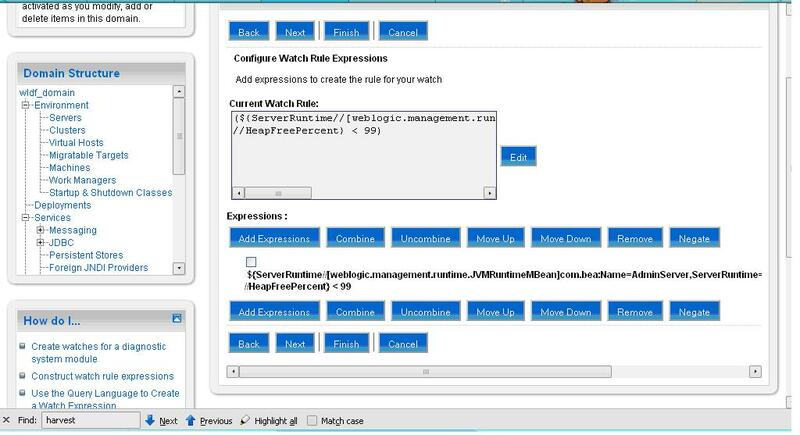 We can use ‘AND’/’OR’ operations to create Watch Rule as per requirement. 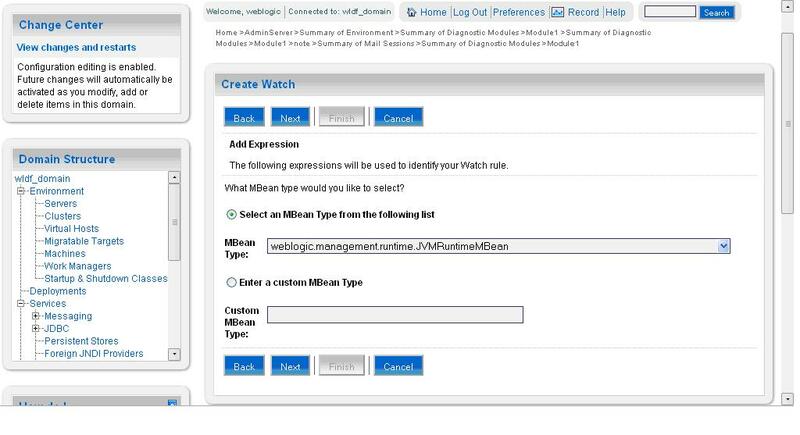 After all the above setting we will get an email update if the condition mentioned in the watch rule is met. 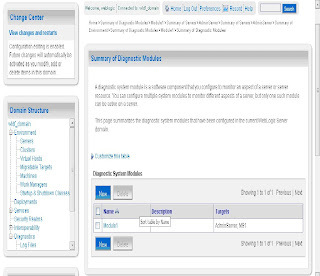 Thanks you first.this article is so detailed with description and images,i think i should config this by your step. some days ago ,someone ask the question about Notification by email in our qq group. this article maybe help him. Thanks for ur appreciation folin!! 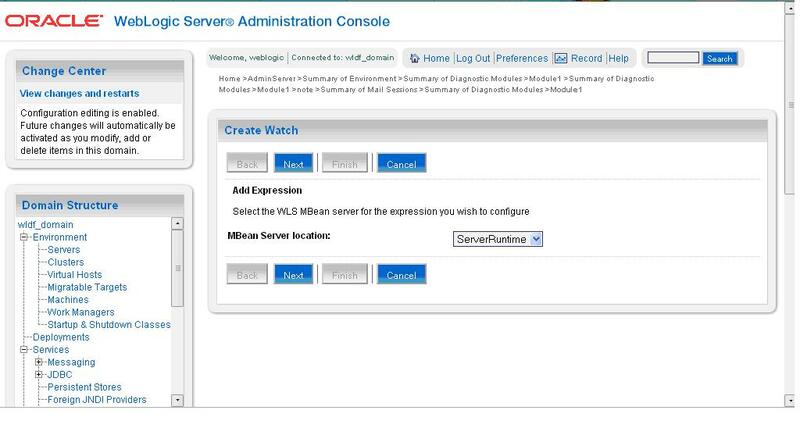 i have configured this step by step but ,in WLS9.2 i do not find this “Select instance for which the Mbean”, after i create watch,and then i can not find the instance page to select ,it is direct to show the Configure Watch Rule Expressions page. so can u help me ? 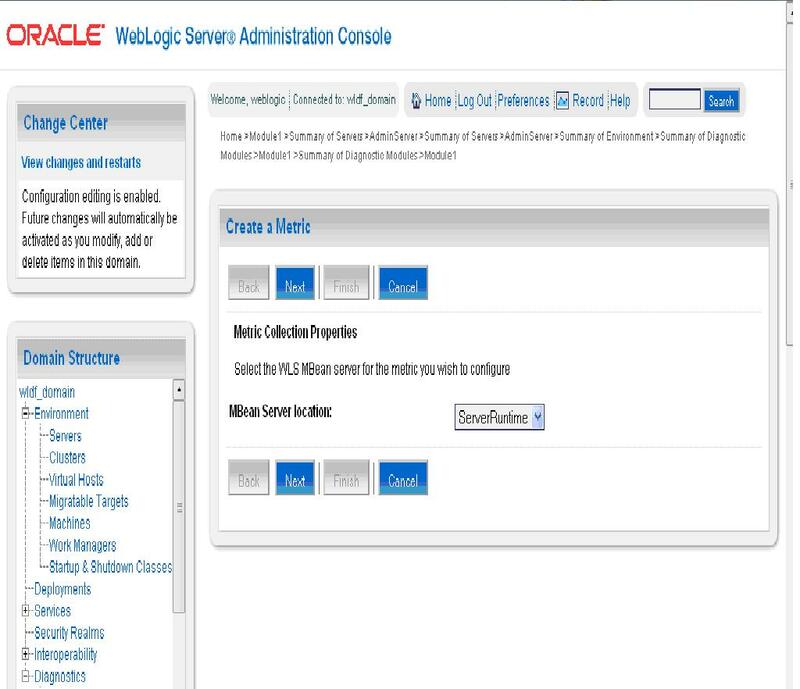 This is a difference in configuration of Diagnostics module in WLS 9.2 and WLS 10.3 configuration. 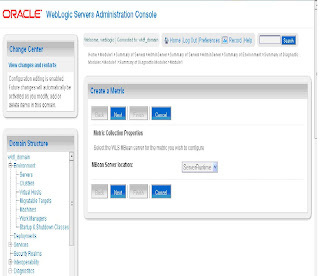 You can skip this step if you working with WLS 9.2. 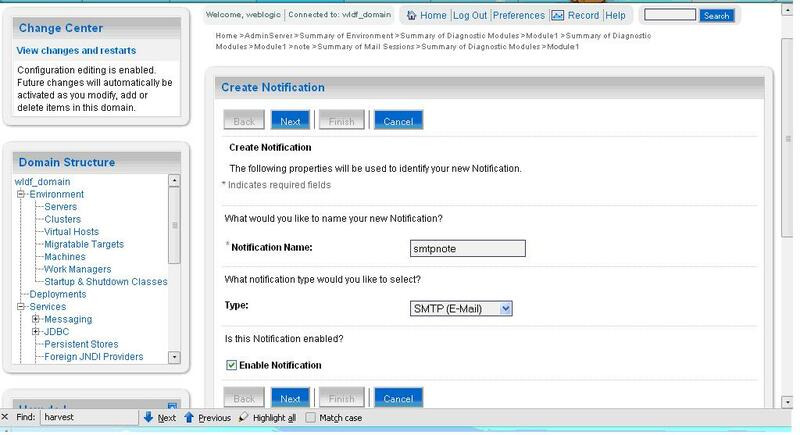 From 10.3 onwards we can configure diagnositcs notification for each instance. 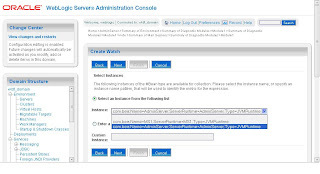 You need not download any client, you can use your company’s SMPT server details (If you can access them. 🙂 ). 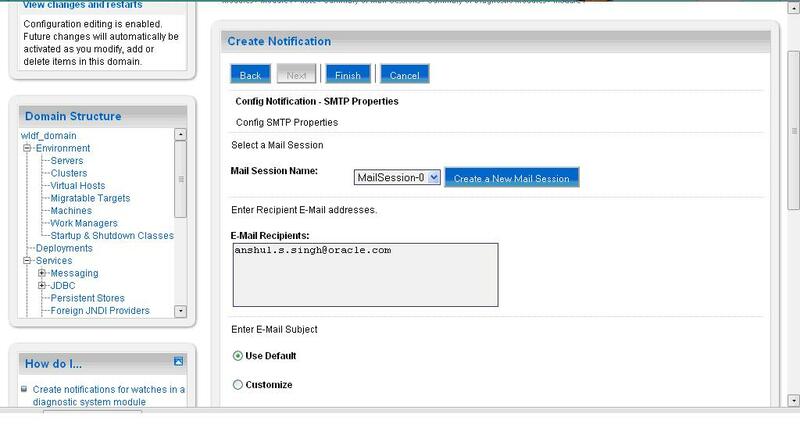 Configure a mail session providing the SMTP server details. 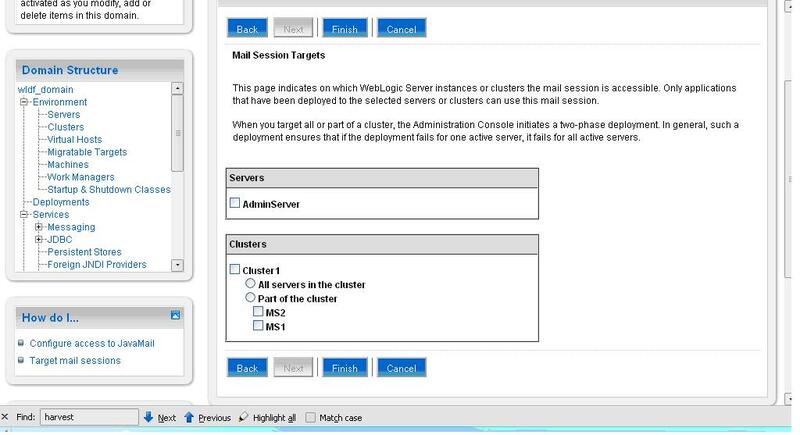 Steps to configure a mail session are below. 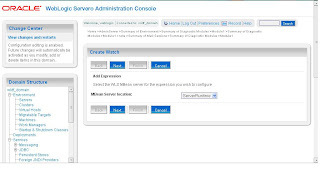 Testing the setup: The email is triggered as soon as the condition / rule defined is met. 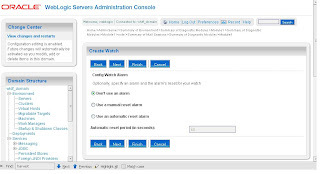 For example if you are monitoring a server shutdown state and if the server gets shutdown. Then it would automatically trigger an email notification. 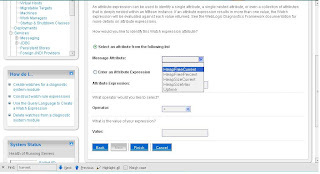 I configure ecaxctly wat u said! 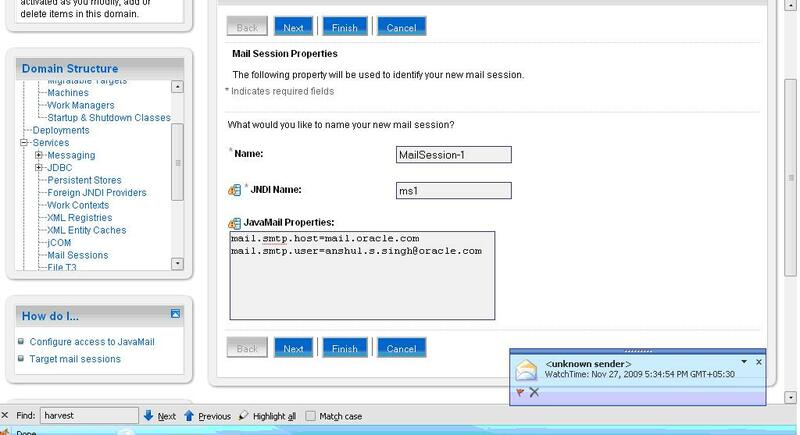 You can install some free email servers to get it work..
Could you suggest how to disable JMX logs in weblogic server? 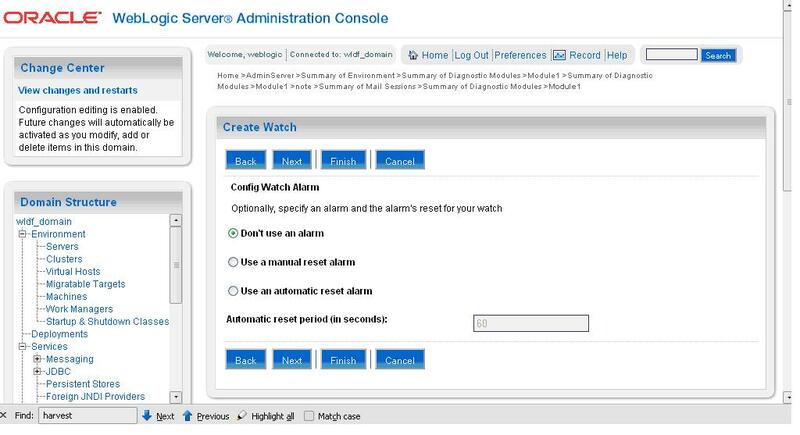 you mean disable logging using jmx? 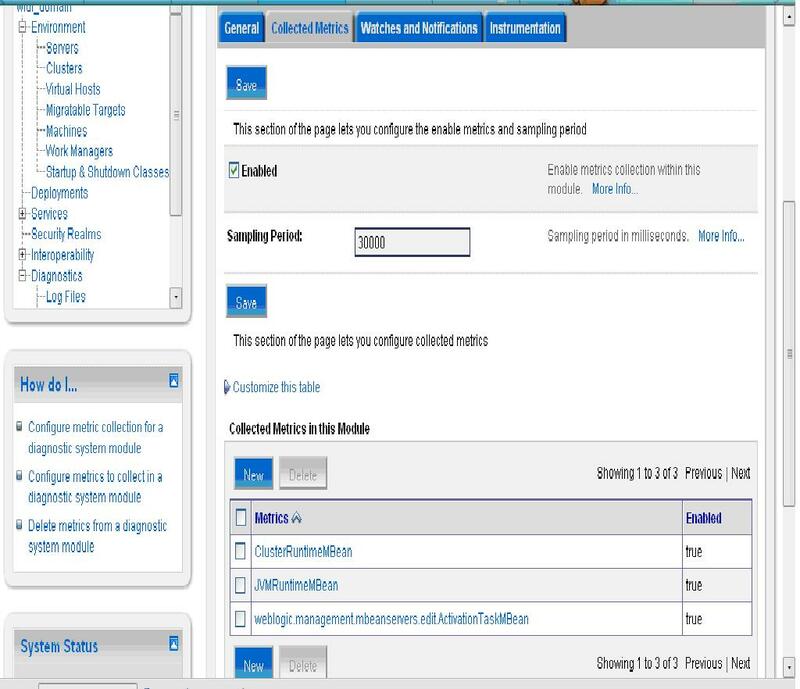 I am not sure what jmx logs are..